The PR550 efficiently removes matted thatch from turf in 20” passes, and its rugged design withstands the most demanding use. Because the rotation is down sweep, the flails propel the PR forward, making it self-propelled and reducing fatigue. Additionally, because it weighs slightly more than other power rakes on the market, with steel guards, heavier wheels, premium bearings, and a 10-gauge steel engine base, the PR absorbs much of the vibration before it is transferred to the handle, which improves operator comfort and handling. Efficiently removes thatch with a softer touch where sprinkler heads or other objects may be a concern. 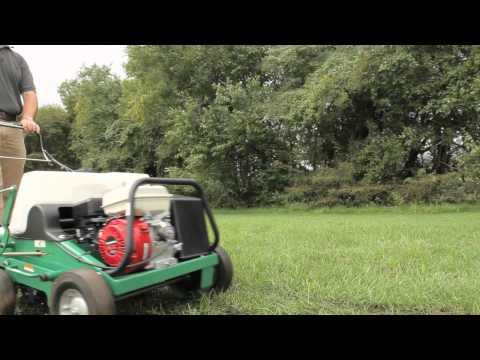 Everything you need to convert your PR Power Rake to an overseeder. Kit includes Seed Box (Part No. 350325) and Vertislicing Reel (Part No. 350113) Kit retrofits PR models.